I’m a problem solver. 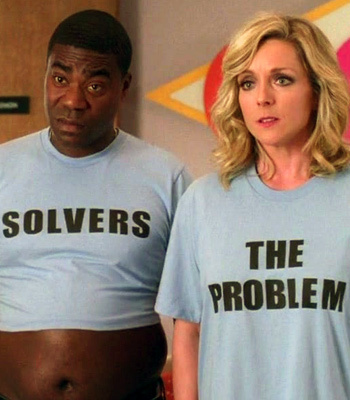 Problem solving combines my love of logic and my love of being comfortable. Logic says if there’s something in my life that is making me uncomfortable, I should do what I can to get rid of it. Within the last couple of years I’ve developed the problem of anxiety. It doesn’t come around a lot and it’s usually pretty easy to get under control considering my love for logic. ** Anxiety, for me, starts in my shoulders and works it’s way to my hands. My response is to kind of shake both my hands Taylor Swift style in an attempt to shake off the bad feelings. That doesn’t work though so I end up talking it out, usually with myself, getting to the root of the worry, and solving the problem. Prayer helps, too. I’ve had more of these anxiety-induced flappy hand moments since my boss greeted me at my door one morning about a month ago holding an abandoned puppy. I took him in, took him to the vet, named him Fred, and almost immediately started to worry. About a year and a half ago my cat died in her sleep. So, naturally, every time Fred the puppy is sleeping I constantly check to make sure he’s still breathing. For the first week or so I was convinced he was going to just die in his sleep. One time when he was so, so little he fell off the couch and I was convinced he was bleeding internally and was going to die in his sleep. The other day I was feeling especially anxious. I was shaking it off all over the place. I knew that in order to solve this latest problem of flappy hands I was going to have to talk it out with myself. In that unspoken conversation that took place in my head I realized that I, in part, blamed myself for my cat’s death. I knew she wasn’t getting over the anesthesia (she had been spayed that morning) and instead of taking her back to the vet, I decided to hope for the best and wait till the morning. (Hoping for the best is another thing I do. It combines my love of not doing anything with my love of being comfortable.) So once I realized I blamed myself (but only in part – I still feel okay also blaming the vet) for my cat’s death I was able to cry a bit, forgive myself, and move on. I reminded myself I’m doing everything I can to make sure Fred is healthy and happy and moved on. Problem solved! Comfort and happiness achieved! But then tonight I noticed another problem that was likely to set my hands a-flapping. Like blaming myself for Strawberry’s death, I have been shoving this problem down below the surface for a while and attempting to ignore it. Also like blaming myself for Strawberry’s death, my precious puppy Fred has brought this problem to the surface. The problem is that I’m lonely. Now I’ve written about loneliness and love before and how even though I’m single my life is so full and I am not lacking anything. And that’s totally still true. Last night I had a freaking Office marathon sleepover where my friend Christine and I laughed at and played with and snuggled with my cat and my dog and ate about a can of Pringles each. Then we woke up this morning for some more Office and ate McDonalds breakfast. So…. my life is not lacking. But here’s the thing about loneliness, it sneaks up on you. There are some things I do alone that make me feel independent and strong and awesome. Like going on road trips (both in the States and in the DR) public transportation and buying large pieces of furniture and teaching first grade. But there are some things I do alone that make me feel lonely. Like making a casserole and, as it turns out, raising a puppy. It’s not that I’m lonely because there’s nobody around. Melissa lives in the same apartment complex, the neighbor kids are always up for a hang out, and I am literally stuck in a room with 16-18 people every day of the business week. It’s that I’m lonely for someone to do life with. I’m lonely for someone who cares as much about Fred as I do and with whom I can split the walking-downstairs-for-potty-break shifts. I’m lonely for someone with whom I can dream about a house and a yard. I want someone who daily listens to my stories about weirdo spirit games kids are playing in the bathroom and this thing I read about in a book. I’m longing for affirmation and encouragement from someone I know loves me. This is going to sound totally weird (and I swear I don’t mean it in a sexual way) but I’m lonely in loving my body. The problem is that I want a husband. Well, first I want a boyfriend but then I want him to propose to and marry me. And the even bigger problem is that this is a problem I can’t solve. I can’t logic my way into a loving, encouraging relationship with a bilingual Jesus lover who also wants to adopt. There’s nothing I can do to make the right guy appear. My head hurts and there’s no nail there to pull out. So what do I do? *For the record, I am trying to get better at just listening and nod encouragingly without trying to problem solve because I’ve come to learn that that is how some people need to be loved… But I still don’t understand why someone wouldn’t want to at least try to fix the problem. But I’m trying. **I understand that for some people anxiety is not something they can just talk themselves out of. I do not believe I have stronger will power or more self control than such people. People are just different. All good, just different. Suz, sometimes I read what you write and feel like we are such kindred spirits! I think anxiety springs largely from our desire for control and our forgetfulness of God’s faithfulness. That’s why I think it says for us to make our requests through supplication and prayer with thanksgiving–it makes us remember what God has already done so we are encouraged to hope for what he will do and it makes us remember that nothing is in our control–it’s all in His hands! The older I get, the more I realize everything is grace. If you (and I) meet someone, it will only be through God’s grace. It’s only by His will and His orchestration of events that it will happen. Which sometimes makes us anxious as to if/when that will happen and why He seems so slow on the go. Praying for you and Fred! I like those verses. Something a friend of mine said a few months ago made me look at them in a new way. I’m always reading things like, “Do not be anxious,” and I’m like, “HOW? !” and just use the lack of a step by step checklist as an excuse to not be obedient. But Paul gives us the step by step checklist right here! Don’t be anxious. HOW?! Pray. Give thanks. Tell God want you want. That’s the way to peace and worry has no room in peace. So, so true. I trust God’s timing because the life He has for me is the very best life.